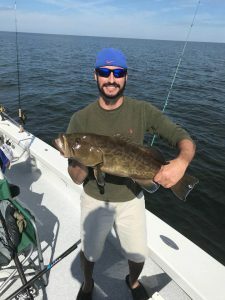 Eric Suarez (WEC BS ’10, MS ’15) is the is the Senior Nonnative Fish and Wildlife Biologist for the South Region for the Florida Fish and Wildlife Commission. 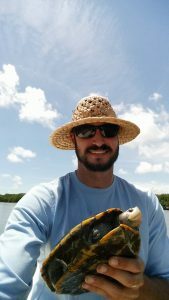 He oversees all field operations related to nonnative species, in this case terrestrial species, in South Florida. 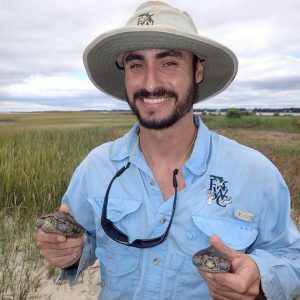 He spoke with us about his work, life, and path to a career in wildlife ecology. When did you know you wanted to work in ecology? Is there an origin story? I grew up in the “concrete jungle” of Miami, catching brown anoles in the yard, so that was pretty much my exposure to wildlife as a kid. There wasn’t a lot of other wildlife around, and my parents didn’t take me to the Everglades or any other natural areas because as immigrants from Cuba, it just wasn’t something they were used to or thought of as a priority in life. The main priority for them was to work as hard as possible to give their kids a better life than what they had, which I am eternally grateful for. For me to get any exposure to wildlife, I always watched Steve Irwin and Jeff Corwin on TV, and thought that would be a cool thing to do, but the closest job I could translate that kind of work into, so that my parents could understand, was veterinarian. 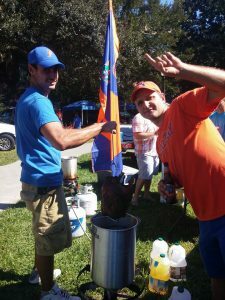 So, I originally came to Gainesville planning to become a vet. Then, while I was at Santa Fe College, I met Dr. Jerry Johnston, and started helping him with his research on turtles in the Santa Fe River. 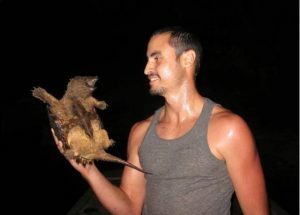 I’ll never forget the first time I went out with him and WEC Ph.D. Student Travis Thomas—we caught an alligator snapping turtle, and he left me with it for a few minutes while they went on to check the other traps. Someone saw me, came up, and offered me $20 for it! I was just like “I don’t think I can do that, this is my first time out here and I think that’s not allowed!” I wasn’t about to screw up the opportunity to work on this project. Driving home, after catching turtles that day, I immediately called my mom on the phone and told her I didn’t want to be a veterinarian. I was going to study wildlife. I am where I am today because my parents decided they would support me in this new field. I’m torn, it’s tough to pick a species. I have to go with turtles in general. If I had to pick a species, it’d be alligator snapping turtles for sure. That is the species I enjoyed working with the most. 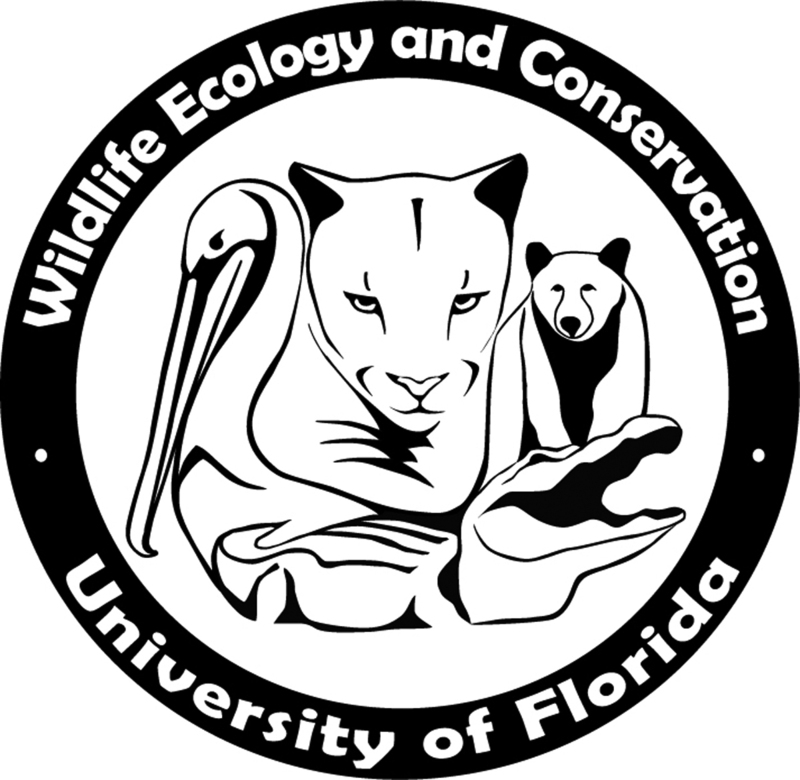 The main reason is that, in a lot of places in Florida, they’re understudied, so it’s good to get some of that baseline data and be able to provide that information to the scientific community. It’s also being able to work with these massive, strong, big turtles that have been here for millions of years. People like to make the analogy that it’s like working with dinosaurs. I really enjoyed working with a powerful animal like that, and being able to understand why they’re so cryptic, what their behavior is like, what are they eating, things like that. It’s just a neat animal to work with. 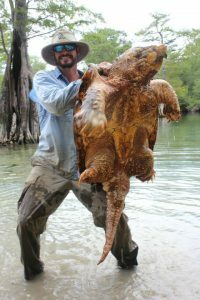 I’ve had the experience of being able to swim with alligator snapping turtles, and just seeing them in their habitat doing their thing is very cool and very rewarding. I also enjoy working in their habitat, the river systems and springs, those lotic type systems. I really enjoy working in that kind of habitat alot since it wasn’t really around while growing up in the “concrete jungle”. I never thought I would have to dodge sturgeon while researching alligator snapping turtles on the Suwannee River. 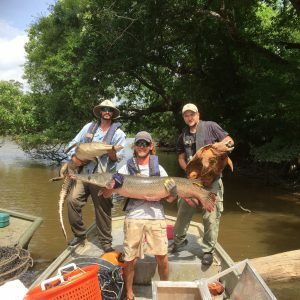 I had to dodge sturgeon while driving the boat, because there are so many sturgeon on certain parts of the Suwannee River that you have to be super careful, and basically dodge them as you’re driving the boat, because they’re jumping all around you. You have to be really careful while driving boats in this area, I never thought that would be an issue. I have a lot of stories like that, if I start really thinking about it. I never thought I would actually be doing this for my career, and life. A lot of it is surreal. Every time I go out there and do something different, or start a new project, I always feel like it’s all kind of an unusual experience for me, because I never thought I would be doing it. It’s pretty crazy, when you find something that you love and you get to have all these experiences. I make lists, I use a lot of sticky notes, and I use my outlook calendar quite a bit. I also use a whiteboard. I have a lot of stuff going on all at once, and any day I can get a call from upper management in Tallahassee, saying “You need to drop everything you’re doing, and get me this information now”. If there’s anything I’ve learned in the two years I’ve been doing this job, it’s time management, because there’s a lot of stuff going on and multitasking is an everyday thing. How have you balanced work and fieldwork with your personal life? By having a very supportive girlfriend, and now wife (WEC Alumnus Elena Suarez). That is the one way I get to manage my personal life the most, by having someone that understands what I want to do, and what I need to do to get ahead in this field. As long as she’s supportive, it’s very easy to balance my personal life and work. I like to go outdoors, and to spend time with my wife and friends. I go canoeing and hiking quite a bit, but also enjoy playing a viewing various sports. It is also extremely cool that my wife and I work in the same field. That makes everything we do outdoors really fun since we have very similar interest. A lot of field guides and scientific papers! I’m also reading a book about the wildlife and habitat of Florida. I would maybe volunteer a little less. I definitely took a hit in grades on some of the my more difficult classes, so it might have been nice not to volunteer as much, and be able to have some more time to focus on some of those higher level classes and graduate with honors. I still graduated with a good GPA but it would have been nice to graduate with honors, and I think if I hadn’t given up all my weekends and weekdays I would have probably been able to do a little bit better in school. If anybody reads this, I don’t want them to take it as me saying not to volunteer—definitely volunteer! Get as much experience as you can, because that’s how I got to where I am today. Anthony Lau and Jessica Burnett. I always have a lot to say! I encourage people, no matter how hard it gets in school and in this field, definitely to never give up. Don’t be afraid to put yourself out there, and maybe work on a species or project that you’re not familiar with or never cared for. If it’s something that you’re not interested in, it doesn’t mean you’re never going to be interested in it. Definitely put yourself out there, and volunteer whenever you can. Get as much experience as possible. Don’t ever be shy at a conference, around your peers, faculty, or professionals. Go out, talk to people. Network as much as you can. At the end of the day, besides your academics and publications, and the work that you’ve done, it really helps to know people in this field. Who you know carries a lot of weight. I recommend people put themselves out there as much as possible, do as much as possible, go to conferences, do as much as you can in addition to your regular schooling, and you’ll get to where you want to be and be successful at it. Thanks to Eric Suarez for sitting down with us.